I've wanted a Minelab SD2200D metal detector since last summer. I almost purchased one last year, but shied away at the last moment. The reason is that I have hard a hard time justifying the detector for the areas I normally hunt. The SD excels on larger gold, especially in highly mineralized ground. The areas I frequent have low mineralization and small gold, unfortunately, so I was not able to convince myself the SD would help me much under those conditions. I resolved this by promising myself I would get out of my rut, and make a concerted effort to get to more locations, particularly those that might offer a chance of finding a large nugget with a metal detector. My mining buddy Jeff Reed feels the same way... we both want to find some nuggets weighing over an ounce. We are trying to cram as many trips to remote sites as possible into the short Alaskan summer. The main investment is getting the time, and I want to have my bases covered detector-wise, so I have added an SD2200D to my detector cabinet. It will supplement, not replace, my Gold Bug 2. I also purchased a number of Coiltek accessory coils. When setup to test run in Anchorage, my new SD had a strongly wavering threshold. It did function, though, and I assumed this was normal, as all the new units we have in stock do the same. It was a kind of "warble". Then I got the unit home and gave it try in my front yard. It would barely work! I remembered a problem I had at my house with a couple years before with a Fisher Gold Bug. A guy a couple houses down has a serious ham radio setup. It killed the Gold Bug, and was having the same effect on the SD. The machine seemed to work, but would barely pick up it's own battery! I decided it must be the ham radio unit, and decided not to worry about it. It did start me wondering about the uneven threshold, however, and I was curious to see how it would do out of town. I decided to make a trip to Crow Creek Mine to play with the machine. I truly did not expect to find any gold with the SD2200D, however, as the creek has had thousands of detectors on it. It has been getting hard to find much gold by simply scanning the surface; you need to dig into the material to expose deeper gold. In the back of my mind I did hope it might find a larger, deeper nugget that had been missed, but realistically I figured to dig nails and bullets. When I go setup for small gold, I always find gold. When I go with large coils looking for large nuggets, I often get skunked. Still, I had seen my friend Will Holden find a nice nugget on his first outing with a Minelab SD2200D last spring at Crow Creek. When I arrived at Crow Creek I was pleasantly surprised. The threshold got much quieter and very smooth. The detection depth increased over my tests in town. It turns out that electrical interference in Anchorage is rather severe, and that the Minelab SD2200D units will only function well if removed from town. I suspect the radio installations at our Elmendorf AFB may be the source of the interference. So if you get a new SD, and it seems it has performance problems with the audio, be sure to consider that it may be radio interference in the area before you complain to your dealer. The photo above shows my standard outfit. My new SD2200D outfitted with a Coiltek 14" monoloop search coil, a set of Gray Ghost headphones, a Hodan pick, a cut-down garden hoe, a plastic scoop to recover targets, and a wide-mouth plastic vial for those nuggets. The battery for the SD2200D is carried in a little pack on your back, which has an extra pocket for a cold drink and mosquito repellent. I took the machine to the very head of the claims. This area is mostly virgin ground, and so has less trash. It has produced some coarser gold, but finds have been sparse. I decided to start at the top and patiently work my way downstream into areas with more gold, but more nails. The SD was smooth and quiet, but I hit only a couple of targets in several hours of careful scanning of cut banks. No trash, but no gold either. I finally approached the middle of the claims. Many of the larger nuggets found at Crow Creek have come from this area, but it is heavily infested with nails and other trash. I started hitting some nails and bullets. Many of the nails were at depths exceeding a foot, requiring that rather deep and time-consuming holes be excavated. I don't mind this much, it is just part of the game. The SD does have a type of discrimination, but I dug all targets to get used to the detector and what it could do. The monoloop coil was absolutely steady, and I did hit a couple of bullet fragments with it that would have weighed about a half pennyweight if they were nuggets. The main item of interest was a type of rock found at Crow Creek. The hard rock mines upstream have shed some chunks of ore that are found in the creek. It is a wild mix of arsenopyrite, pyrite, galena, chalcopyrite, sphalerite, and even a little free gold. The sulphide mix normally gives a VERY strong signal from a White's Goldmaster. They are a type of positive "hot rock", in other words they respond with a positive signal similar to metal. The SD ignored them entirely. The day wore on, and I still had found no gold. I decided it was time to find something to take home, so I got my Gold Bug 2 out of my truck and hit the hill. I had the 6" coil on it, and hit some holes where people had obviously been getting some gold. I managed to eke out 30 small nuggets that had been missed. They were all smaller than the Minelab could hit with the 14" coil, with a total weight of just over a pennyweight. The nice thing about going for the small stuff is that you rarely go home empty handed. The real tests are upcoming. The SD2200D will see my claims on Mills Creek this fall. I am working on a drive-in trip north to Petersville the weekend of the 4th of July. The area has extensive heavy equipment workings and hotter mineralization. I have never worked there, so it will be fun. 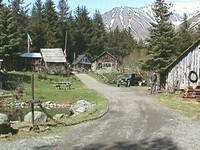 I am also working on a fly-in trip to some old hunting areas in the Wrangell Mountains. I have pulled thousands of nuggets from the location, up to 1/3 oz in size, but the big one has eluded me. One to three ounce nuggets were common there in the old days, and some of the ground is very iron mineralized. I'm hoping the SD will find the big one I have missed. I also have hopes for other areas, but summers are so short here it is hard to pack it all in. I will be posting results of all these trips on this site as they occur, so stay tuned.